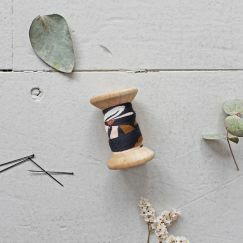 Atelier Brunette offers its own range of bias tape that match the entire Atelier Brunette fabric collection. The bias tape makes it ideal to add a professional touch to your sewing creations. All Atelier Brunette bias tapes are made in France and have a folded width of 1 cm.